While red and green may the official colors of the holiday season, red, gold, and silver add a sophisticated touch to the traditional holiday look. 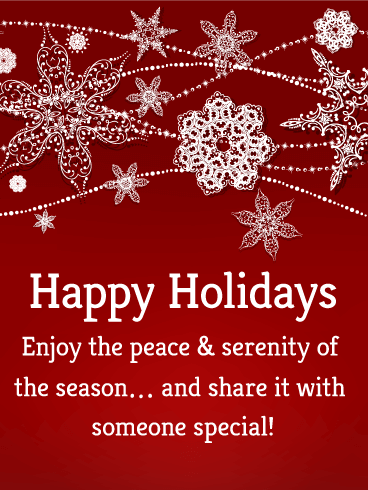 Use this season's greetings card to share some holiday cheer. 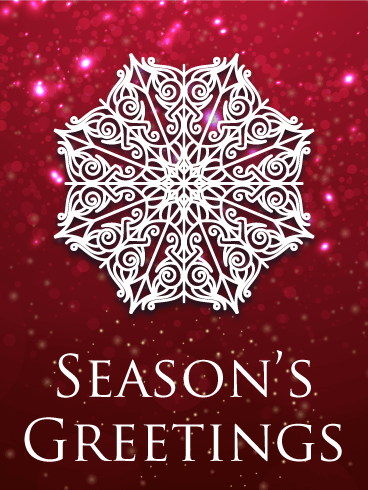 Glittery gold and silver snowflakes sparkle and shine as they drift down the red background to the "Season's Greetings" message at the bottom. 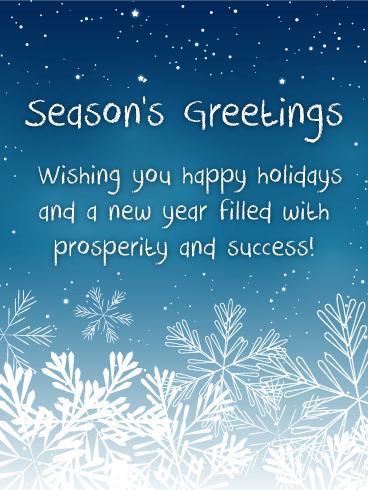 This season's greeting card is the perfect way to welcome and celebrate the season! As we celebrate the holiday season, our winter nights are often filled with joy and cheer. 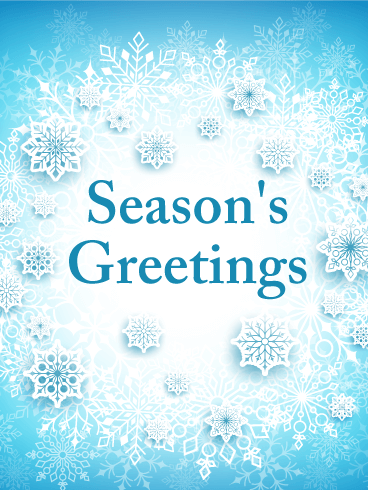 Use this season's greetings card to celebrate these festive nights with friends and family! The colorful background features geometric shapes that fade from dark blues at the top to light blues and whites at the bottom. Pretty snowflakes frame a solid white snowflake that wishes a "Happy Holidays" to all who receive it. Send it today! 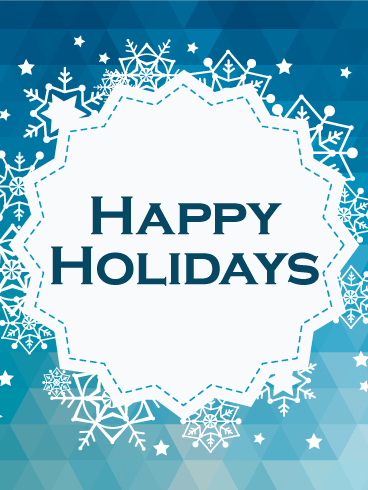 Celebrate the holidays with this season's greetings card! The rich red background is adorned with dark red snowflakes and light red spots. 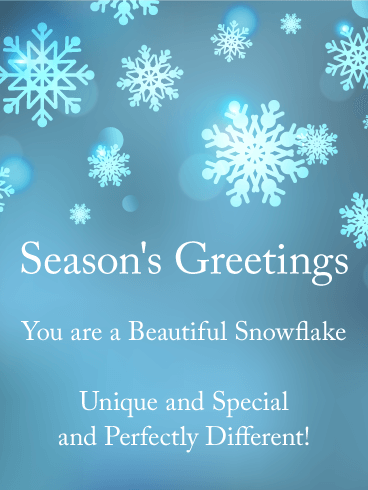 The top and bottom of the card is framed by elegant white snowflakes, swirls of white, and small white stars. 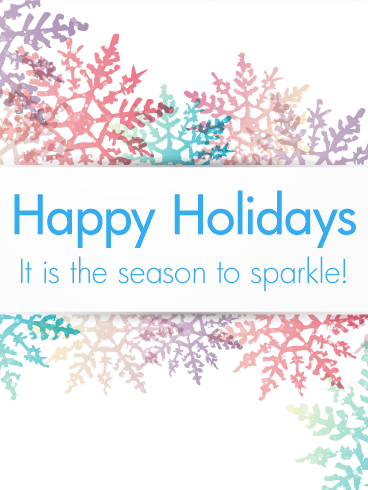 Use this shiny season's greetings card to say "Happy Holidays" to the loved ones who make the season so wonderful! 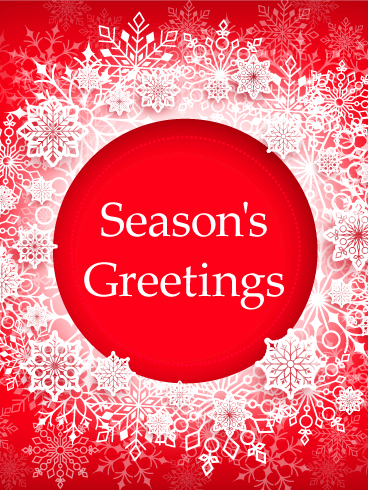 Do you need a bright, colorful season's greeting card to send your holiday wishes? 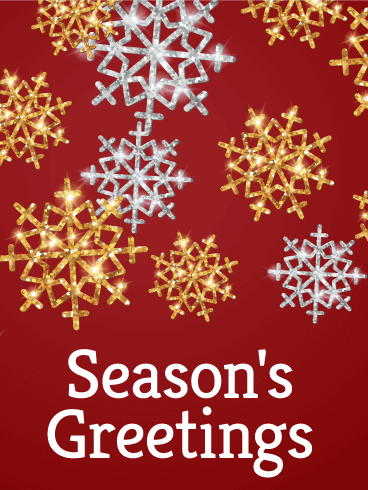 This season's greetings card is the perfect one for you! The bright red background is filled with elegant light red snowflakes. 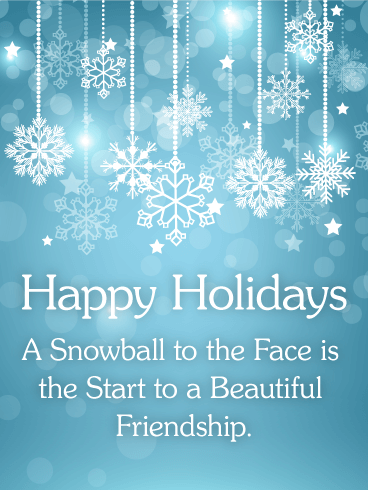 A white "Happy Holidays" greeting is framed by a large white snowflake and four stars. 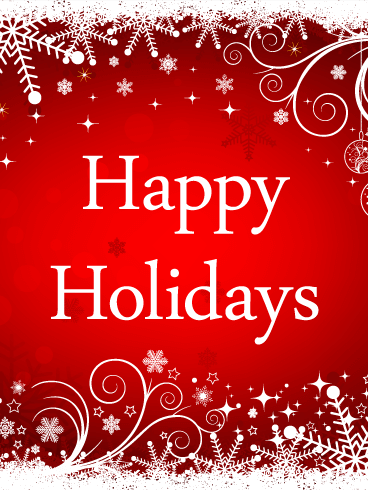 Select this cheery holiday card to celebrate the season and spread the holiday's cheer! It's the most wonderful time of the year! 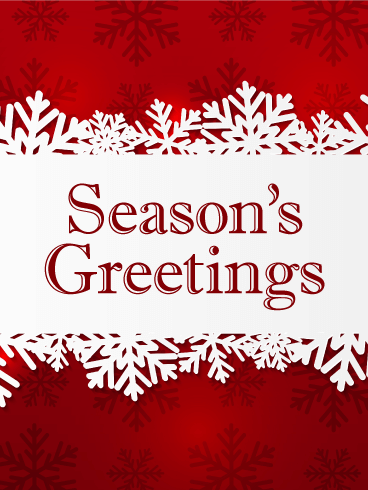 Celebrate the season by sending a season's greetings card to your family and friends. 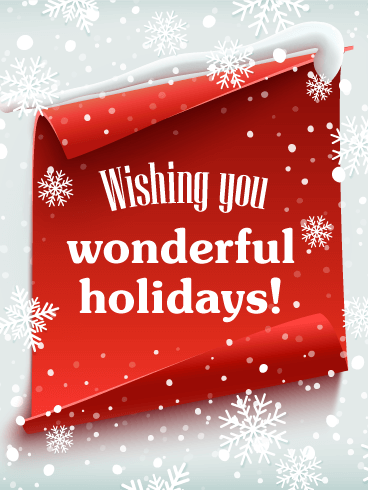 This cheery card features a message of "Wish you have wonderful holidays!" on a curl of bright red paper in a winter's snow. The gentle snowfall includes large, elegant snowflakes, which have started to gather on top of the paper. 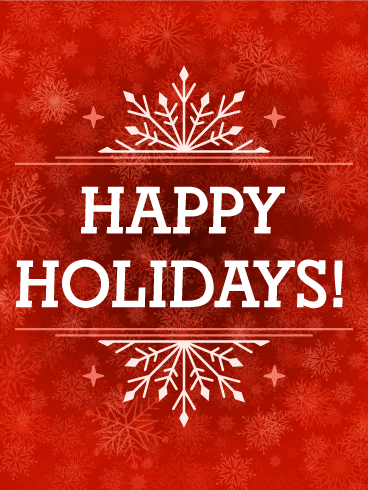 Spread holiday cheer by sending this card today!